In a front-page piece in Sunday's New York Times, reporter Jason DeParle touts family structure as a neglected factor in the increase in income inequality. I don't have a lot of faith in some of the researchers DeParle cites (like Scott Winship, who has previously argued that growth in inequality isn't such a big deal because "the cost of living has risen less for the poor and middle class than for upper-income households"!!). But DeParle also cites a more credible source, sociologist Bruce Western, who he says "found that the growth in single parenthood in recent decades accounted for 15 to 25 percent" of the increase in income inequality among families with children in the last several decades. But when I turned to Western's published research on this issue, I found it to be somewhat more complicated than DeParle's story suggests. In research published in the American Sociological Review, Western and his co-authors separated the correlated effects of education, single-parenthood, and maternal employment. Western's Table 4 summarizes his findings—I've pasted it below, along with a bar chart of the percent of change in family inequality explained by each of his factors. 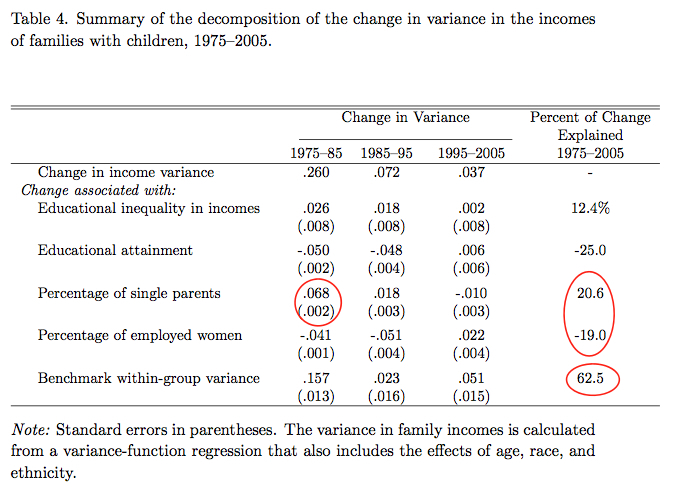 So, yes, as you can see, an increase in the percentage of single parents between 1975-2005 did contribute to an increase in family income inequality, but note that the increase in women's employment offsets basically all of the family structure effect (the percent change for each is circled in the top red oval in the last column of the table). If women's employment (and educational attainment) had stayed flat over the last three decades, perhaps a story like DeParle's would have merited the NYT's front page, but it hasn't and it doesn't. 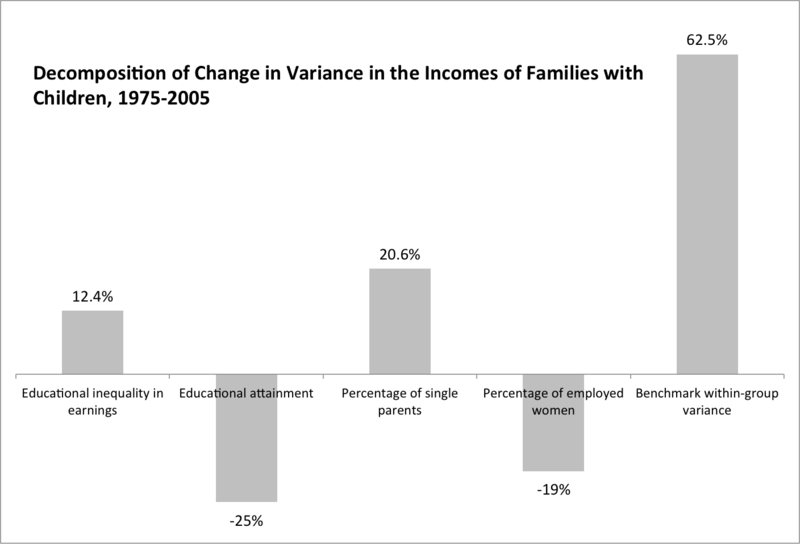 Moreover, note how the effect of the increase in single parenthood on inequality is concentrated in 1975-1985. So, not exactly front-page news in 2012. Finally, look at how much more important "within-group" inequality is in accounting for the growth in inequality. This is how much of the overall growth in inequality is due to increasing inequality within groups of people with the same family structure or level of educational attainment. ... though inequalities in education and family structure have been central to research on incomes, over half of the increase in the variance of family incomes is related to the growth of within-group inequality. .... Labor market researchers see within-group inequality as reflecting the insecurity of earnings. Our results point to a broadly-based increase in income insecurity that is concentrated neither among low-skill workers nor single- parent families. Some researchers describe “a great risk shift” in which the salient fact of high inequality is not the distance between rich and poor but the novel insecurity of incomes. That's a very different story than the one DeParle reports. There are plenty of other problems with DeParle's piece. I'll try write more about it later this week.